Chiang Mai is Thailands capital of the North. It’s an amazing city that has tons of things to offer regardless if you visit for a few days, weeks or even several months. I lived in the city for 3 months starting with January 2018 and it was one of the best times of my life. Most likely that was not my last stay in Chiang Mai and I’ll be back for more! In this article, I will write about the best things to do in Chiang Mai from my point of view. These were the ones that impressed me the most. Since this city is always lively, I will divide the list into two different categories: best things to do during the day and at night. Chiang Mai is home to more than 300 temples, some of which are centuries old, dating back to the time the city was enclosed behind walls and the moat. This is why there’s a high density of temples within the old city. So just by walking around, you could visit more than 20 different temples. Although it’s a temple, I did not include it in the above list because Doi Suthep is the emblem of Chiang Mai and a must visit for any tourist. It’s located at the top of the mountain that oversees the city and is the spiritual guardian of Chiang Mai. As it’s 15 km away from the city, the best way to reach it is with motorized transport: either rent a scooter or get a red cab to drive you there. The best place to get a red cab is close to the Chiang Mai Zoo, where red cabs are usually lined up expecting tourists. They leave one by one as they fill up, so you can be sure you’re not overcharged for the trip. The adventurous tourists that feel like they’re in good physical shape can also treck to it. Once there, you’ll get to see one of the most intricate temples there is. With an abundance of Buddha statues, golden roofs, the smell of burning incense and the ever-present monks, you’ll be glad you came all the way to this mountaintop. The Phu Ping Palace lies close to Doi Suthep, so if you visit the temple, drop by the palace too. You won’t be disappointed. The most impressive feature of this attraction is the huge garden that holds a variety of beautiful flowers but also a lot of different types of trees. Please note that you’re not allowed to go inside with short pants/skirts or other revealing attire. But don’t worry, there are a few shops in front of the entrance from where you can rent out a pair of pants if needed. Nimman street and its neighborhood is the modern area of Chiang Mai. It’s full of coffee shops, restaurants, bars but also co-working spaces. Some people prefer this area over the touristy old-center, and I can understand why. One of my favorite things to do in Chiang Mai was to eat breakfast at a little-known cafe called Smoothie Blues. It lies directly on Nimman street, next to the McDondals and makes the best sandwiches ever. There were more than a dozen option of avocado sandwiches on the menu, which for a vegetarian is a dream come true! Other places I recommend checking out are The Salad Concept, Healthy B Cafe and Larder Cafe but there are plenty more if you just walk around the streets. The only caveat is that some of these places have funny opening hours, some opening as late as 11. Chiang Mai has multiple night markets going on daily (the Night Bazaar), while some of them are on a weekly basis such as the Sunday market. These markets are one of the best places for souvenir shopping, getting some local street food or buying clothes at some very cheap prices. Maya shopping center is one of the most modern in Chiang Mai. 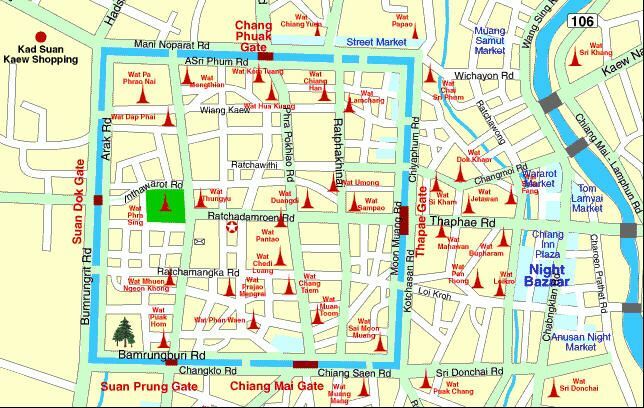 It’s located in a very central position, at one of the ends of Nimman street. At the very top, you’ll find a terrace full of bars where you can enjoy a cold beer or a cocktail. There’s even a platform from where you can get the best view of the city at night time. It’s worth mentioning that the mall closes at 9 PM, but the rooftop stays open until midnight. So during the last hours, it’s only accessible by the lifts from the left side of the building. Chiang Mai has a pretty active nightlife with a lot of different bars and clubs opened throughout the city. The only disadvantage is that unlike in the western world, most of them close at midnight. This is why it’s best to go out earlier than usual, like 9 or 10 pm. By far the most famous club in Chiang Mai is Zoe in Yellow, which is located in the old city center. There’s actually a cluster of different clubs and bars in the area but Zoe is the most popular of them all. This bar is notorious for being a place where Thai girls come to hook up with “farang” (western) men. Another famous one is Spicy, which is located on the East side moat. This is one of the few places that closes later than midnight. So many people first go to Zoe in Yellow for example and then to Spicy for the “after party”. There are a bunch of other clubs in the old center, some of which famous for “bar girls” that have a conversation or play pool with men in exchange for overpriced bar drinks (or more). But you can also club on the Nimman roan where, you can find Warm Up Cafe, the most popular place in the area.